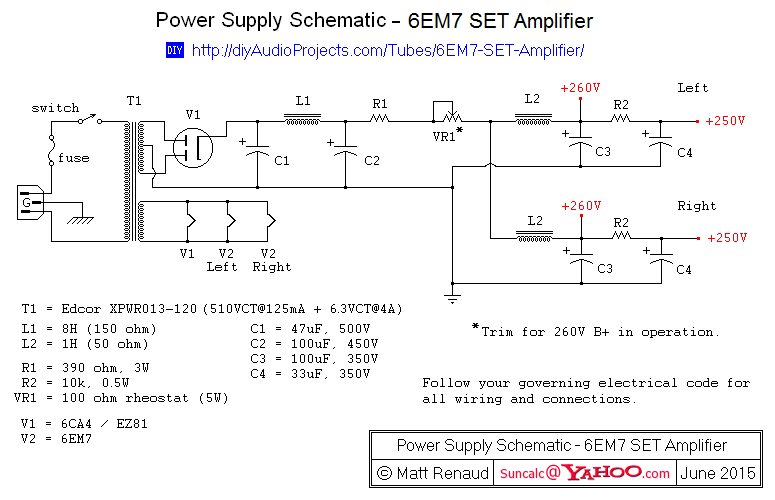 What really drove me to build this 6EM7 amp was an idea about amplifier layout. Looking back at most of my tube designs, and most of those on the internet, revealed a very typical pattern. Amplifiers tended to be flat chassis with tubes and transformers above and electronics below. From a historical perspective this makes perfect sense. Metal chassis were built this way to facilitate packaging and assembly. When people started to make tube amplifiers again, they just removed the upper case and built in the same way. But I wanted something a little different. I wanted a case design that would really showcase the tubes and hide the rest of the electronics. I also wanted a more old time look. Something that harkened back to early tube equipment of the 1920s. 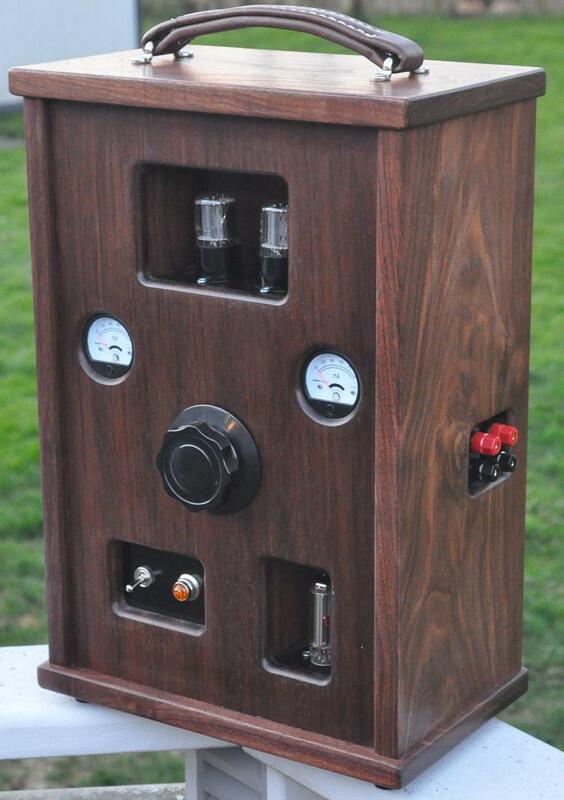 My primary design elements were shadow box alcoves for the tubes themselves, panel meters for monitoring operation, large old style controls, a jeweled power indicator, and an nice accent of leather in the handle to imply portability. But I also needed a good electrical design for this amp as well. So I decided to go back to a design I first presented on the forum in the 6EM7 Power Amp thread. This amplifier is based on a tube intended to drive the vertical deflection circuits in larger televisions, the 6EM7. The 6EM7 tube has two dissimilar triodes in one envelope. One is a high gain, low power unit intended as an amplifier or oscillator, and the other is a higher power unit intended to drive the magnetic deflection coils on the back of a CRT. At audio frequencies the combination is just what we need to build a nice little audio amplifier. One 6EM7 tube per channel. The amplifier design could use either a bypassed or unbypassed cathode and still get the gain required. However, by going with the bypassed cathode the amplifier only requires ≈1.4V-peak to reach full power. This is a better design point and the overall distortion is still acceptable. The calculated coupling capacitor value is 0.047µF for an interstage rolloff of 6.3Hz. 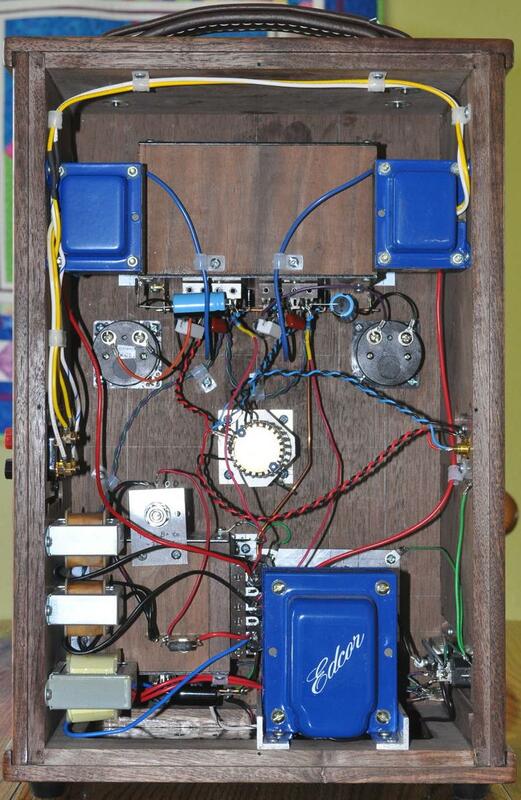 This plus a volume control on the front of the amp and the electrical amp design is finished. Here is the resultant schematic. This is a relatively simple amplifier circuit which will be very easy to drive. The other thing that I really wanted out of this design was excellent channel separation for a deep and wide sound stage. This requires that the power supplies for the two channels be well isolated at their output to the circuits. To achieve this I decided to use three chokes (one main filter and one additional one for each channel) and then provide the gain stage B+ from an additional filter stage after the B+ supply filter. 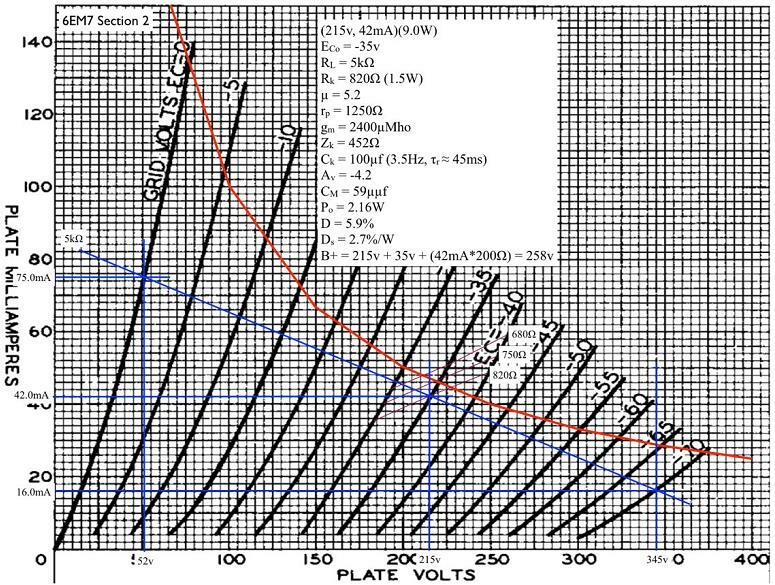 The power supply schematic is shown below. 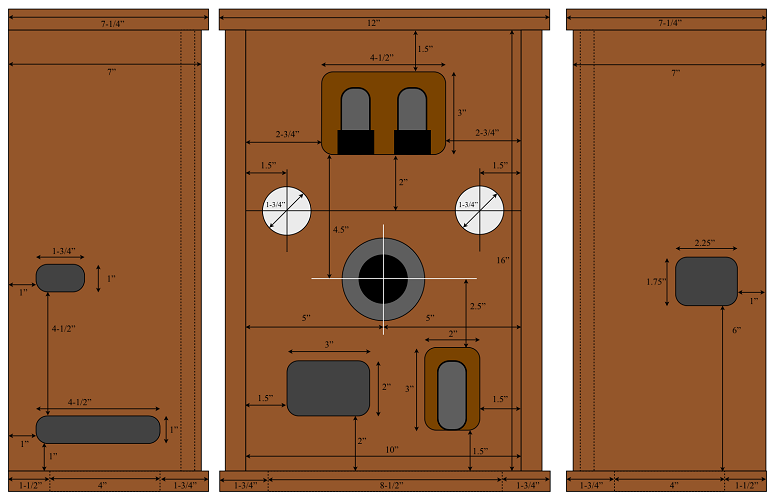 This is the final electrical design which I took into my amplifier build. 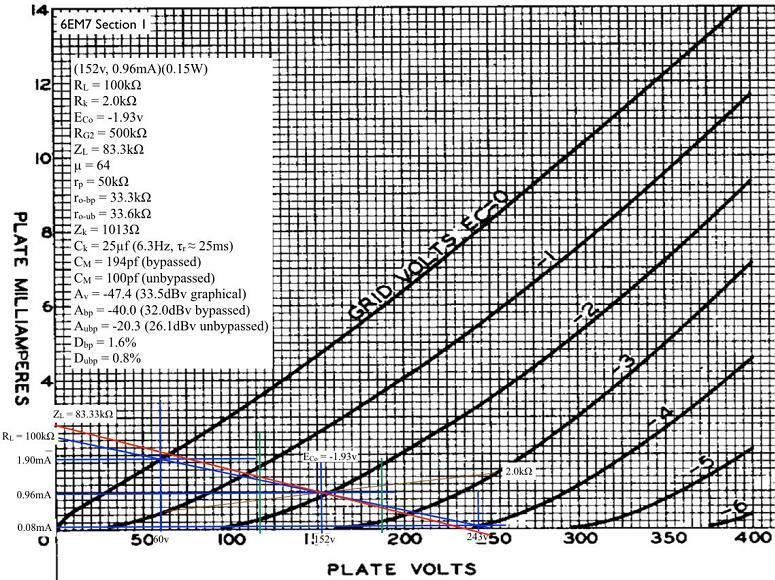 For more information regarding amplifier power supplies, see my notes on power supply design for vacuum tube amplifiers. After collecting up my various parts for the 6EM7 amp, I began to lay out the chassis. I wanted to balance the need with making the chassis large enough with the desire to make the amp easily portable. I also wanted a small footprint. Something small enough that I could place it on a book shelf or on top of a cabinet or hutch without overhanging the front. 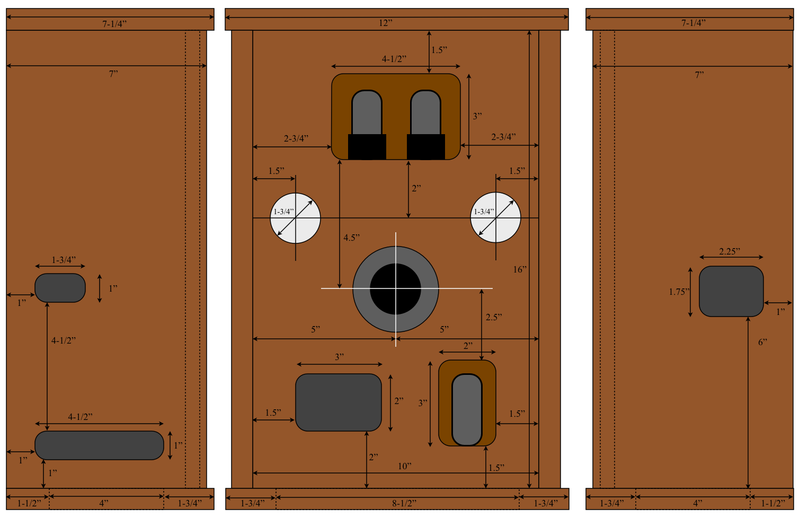 This is the final layout of the 6EM7 vertical amplifier with dimensions. Click the image for a full size chassis layout plan. This chassis layout provides several benefits. 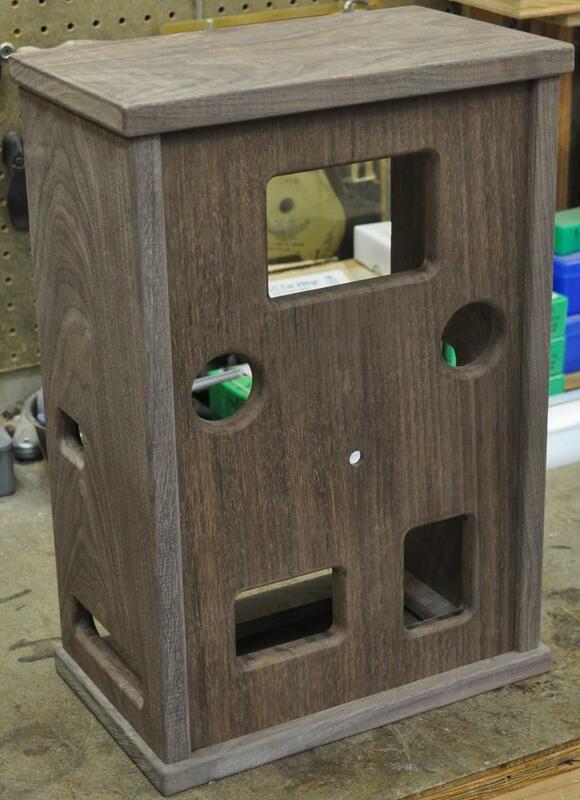 First, it has the small footprint I wanted (12" wide x 7-1/4" deep) to fit the amplifier on a shelf or cabinet. Second, it is tall enough to provide good separation between the power supply section and the audio components. And third, it has lot of internal volume in which to work. So, I chose some nice dark walnut from my wood pile, to reflect the look of the old early 1920's tube equipment, and went to work. Here is a picture of the main wood chassis sitting dry fit on my workbench. At this point, I was still not quite sure how to construct the shadow boxes for the tubes. I could make them all of wood, all of metal, wood with a small mirror in the back, or even something more exotic. In then end, I decided that the tops and bottoms of the shadow boxes would be painted aluminum plate and the back and sides would be matching black walnut. Now it was time to start cutting metal. There is a lot of aluminum required for this tube amp, in addition to the top and bottom plates for the shadow boxes, there are all the mounting plates, a large back panel, and a bottom access panel. There is also a bunch of aluminum angle required for mounting the shadow boxes and suspending the power transformer over the bottom access plate. 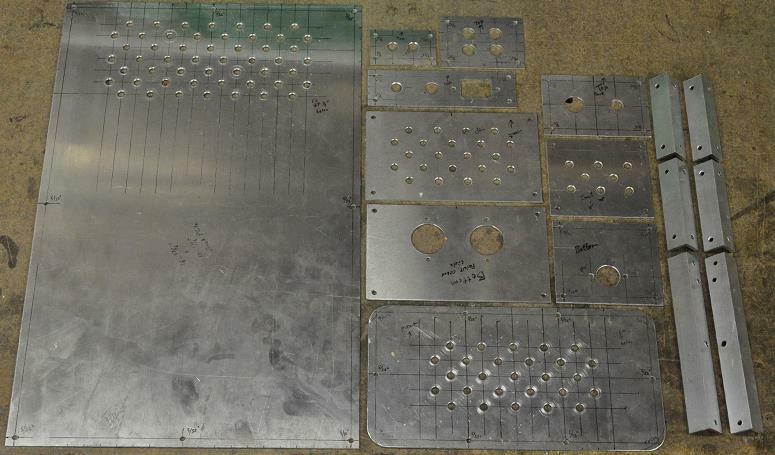 Here is a picture of all the metal parts, cut and drilled, prior to final finishing and painting. After getting everything painted and the wood pieces assembled and finished, it was time to start some assembly. Here is a picture of the inside of the chassis with the shadow boxes and mounting plates installed. In this picture, the rectifier wiring, main power supply filter components, and master ground buss have also been installed. The filter capacitors are mounted on the bottom and side of the rectifier housing and the chokes are mounted on the side of the chassis wall behind the rectifier shadow box. 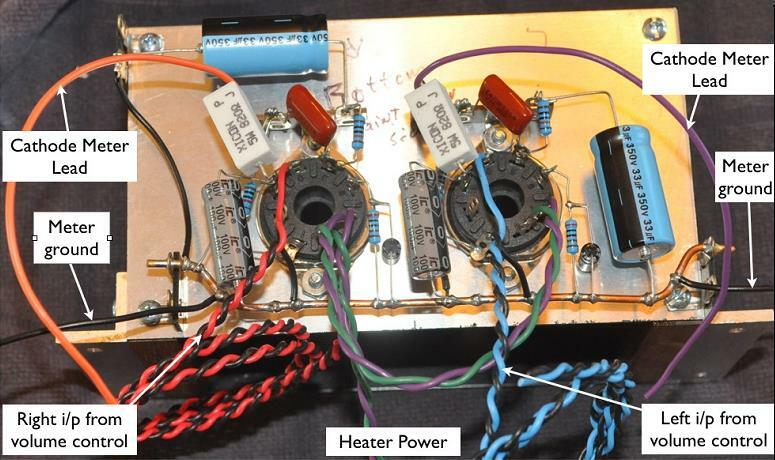 This picture shows how the power supply filter components are mounted. Note that the 150Ω resistor seen in this photo was later replaced with the 390Ω resistor and 100Ω rheostat shown in the 6EM7 power supply schematic above. Following this stage, the main power transformer was installed on the angle bracket seen on the left above and the main power supply was wired up. The photo below shows how the transformer wiring looks from the underside. The inside of the chassis, while providing lots of space, still presents the bottom of the upper shadow box containing the 6EM7 tubes in an awkward position. As such I decided to wire up the entire section with the shadow box removed from the chassis. Below is a picture showing how it looked prior to being inserted back into the chassis. By proceeding in this manner, there are only four wires that need to be soldered to the sockets and two wires soldered to the terminal strips following install. The two large 33µF 350V capacitors in this picture are actually the last stage of B+ filtering for the driver stage on each amplifier channel. Finally here is the inside of the chassis with everything wired up and ready to go. The inclusion of the power transformer and three filter chokes at the base of the chassis make this a very stable build that is in no way top heavy or prone to tipping. I didn't submit this amp to a lot of formal technical testing. This design (or variations thereof) has been built by many different people since I first developed the electrical design back in September 2011 (and then revised it in December 2013). 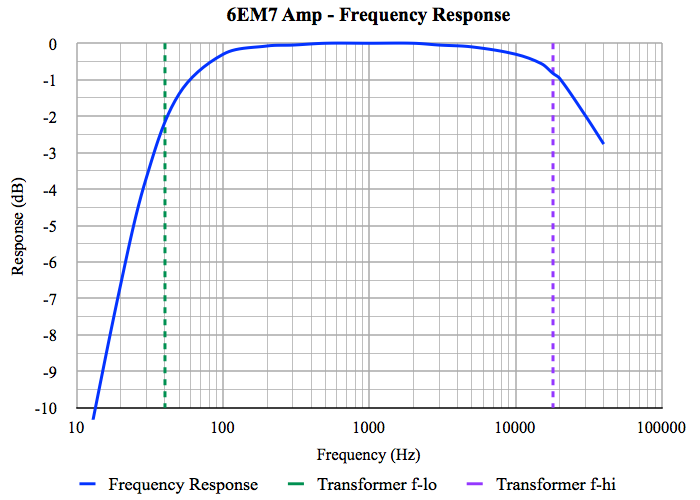 The clean output power from the 6EM7 SET amplifier is 2.2 Watts per channel and the frequency response is consistent with the advertised performance of the audio output transformer (40Hz to 18kHz). Below is a plot of the measured frequency response for the 6EM7 Vertical Amplifier. This is actually an excellent response curve for an amplifier of this type. It represents a good balance between bandwidth and transient response control. I am quite pleased with the result. The 6EM7 amplifier sounds wonderful! 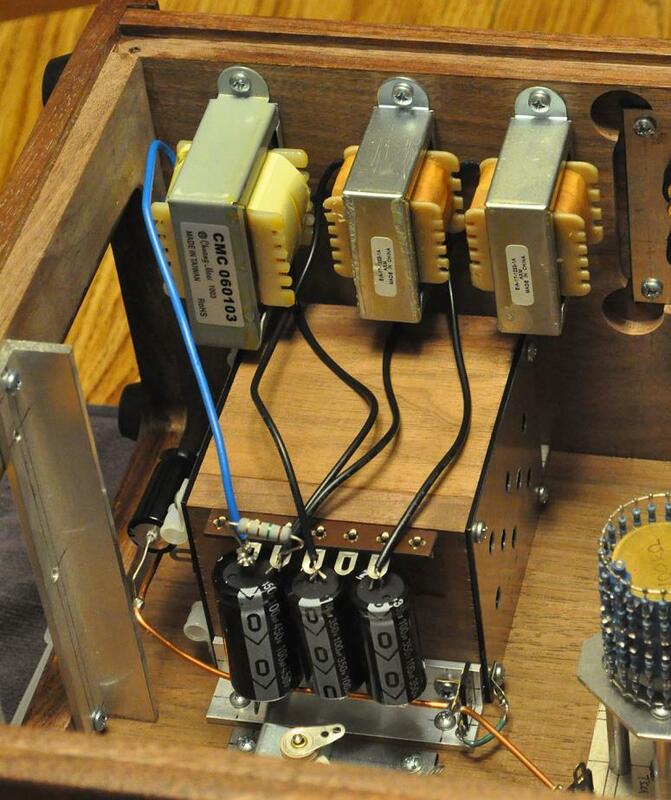 There is really nothing which can compare to the sound of a single-ended triode (SET) amplifier. Bass is well articulated without being boomy, mid-tones are clear and even, and the highs are crystal clear. The amp has exceptional transient response; reproducing my favorite classical recorder piece ("Frederick The Great : Sonata in B-Flat - Allegro" performed by Michala Petri) with clarity, lightness, and vibrancy. 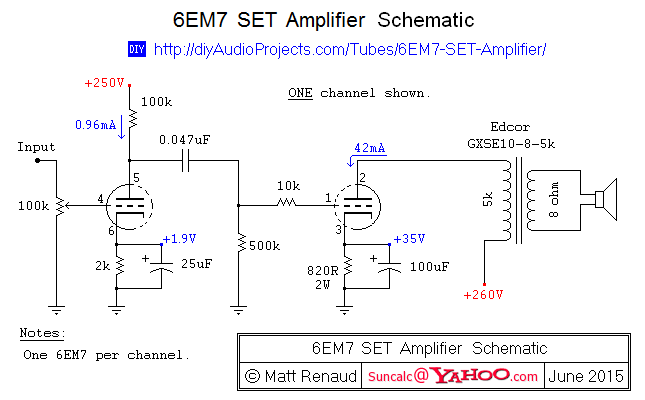 The 6EM7 amplifier build is a success on two different accounts. 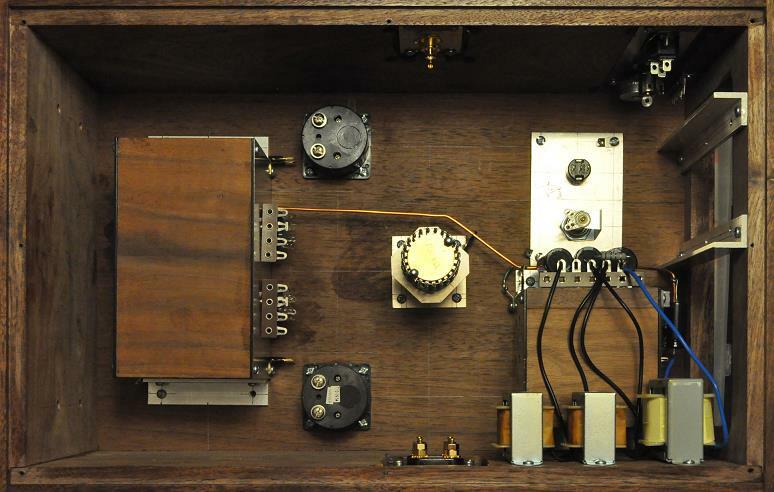 First, the electrical design and execution has resulted in a fine sounding single-ended amplifier. And second, the physical design of the amp, with it's different approach to showcasing the tubes, has resulted in a unique and beautiful amplifier with just the early 20th century feel which I wanted. There are two additional items about this amplifier which are worthy of note. The first is its thermal design. With the tubes contained in small cubby holes, there was some concern with respect to overall heating of the tubes and chassis. This is especially true with the power tubes where the quiescent power dissipation is over 32 Watts. The design approach was to have the tops of the compartment ventilated with holes. The thought was that the air flow pattern would be in through the front, through the vent holes into the chassis, up through the inside of the chassis, and out the vent holes in the chassis back. This would create a convection cooling flow which would keep chassis heating down. This approach was successful in the lower rectifier compartment where peak dissipation was less than 8 Watts. In the upper compartment the design is just marginal. The heat load due to direct infrared radiation was not fully appreciated. The tubes themselves still remain well below their maximum bulb temperature. The impact is on the chassis itself. The black top plate on the power tube compartment has an equilibrium temperature of approximately 156°F (≈ 69°C) in normal operation. This is still well below my standard internal chassis derating temperature of 185°F (≈ 85°C) but it is still higher than I would like. If using this design approach again, I will endeavor to keep these temperatures somewhat lower through larger compartment size, better ventilation, and perhaps the use of a higher emissivity finish on the metal parts. The other design item of note is a small addition I made to the design. 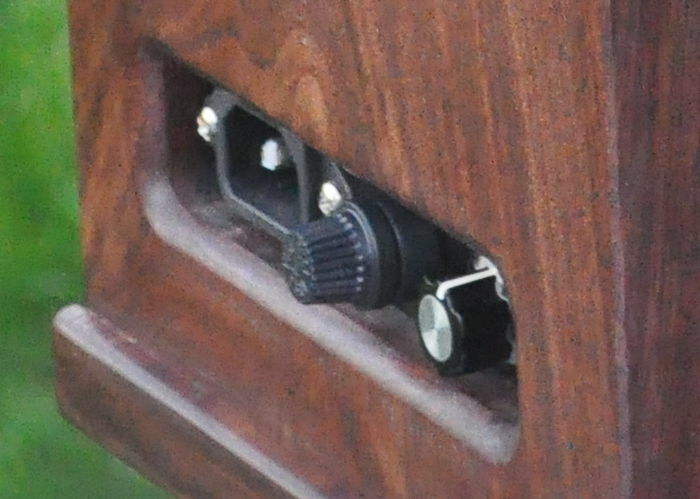 Looking at the side of the amp revels a little control knob right next to the fuse holder. This control has a special purpose. When building up this amp I decided to use a jewel power indicator with a typical 6.3V indicator bulb. However, when testing out the various design elements I decided that even the 0.5 candela type 47 bulb (6.3V @ 150mA) was far too bright. However I did find that the 0.9 candela type 47 bulb (6.3V @ 250mA) could be dimmed across a large portion of it's range by a simple 50Ω variable resistance. So a small 50Ω, 5W wire wound rheostat was put in line with the indicator to tailor its intensity to match the glow of the tubes. It is purely an esthetic addition to the amp but it is one of those little things that can make a piece of equipment just "look right". This 6EM7 amplifier is a great success. It not only sounds good, but it looks good as well. This is a good example of what can be accomplished by simply thinking a little differently about the entire design process. Comments and questions about the amp are welcome in the Vertical 6EM7 Portable Amp thread.